Cape Breton Island is part of the province of Nova Scotia in Canada and lies east-northeast of the mainland. The Canso Causeway bridges the Strait of Canso connecting Cape Breton to the mainland. The northern and western coast front on the Gulf of Saint Lawrence and the eastern and southern coasts front on the Atlantic Ocean. Cape Breton rises in elevation as you progress south to north and culminates in the highlands on its northern cape. It is here that we will spend a glorious week hiking the highland wilds with friends that we have not seen in 25 years. John Cabot (Giovanni Caboto) was the first European explorer to visit Canada and is commemorated by Cape Breton’s Cabot Trail and Cabot’s Landing Historic Site and Provincial Park near the village of Dingwall. The latter is a wonderful place for an extended beach hike. Surrounded by magnificent mountains, you can spend the day walking along the Atlantic beach and return by the inland lagoon. Cape Breton Island is composed mainly of rocky shore cliffs, rolling farmlands and valleys in the interior surrounded by mountains and woods. The Highlands, which are an extension of the Appalachian mountain chain, dominate the northern portion of the island. The Cape Breton Highlands National Park, established in 1936, covers the northern third of the Highlands and that is where our story begins. We selected for our home base the Acadian village of Cheticamp on the Gulf of Saint Lawrence at the western entrance of the park. The downtown area overlooks a large bay protected from the Gulf by Cheticamp Island. Our destination today is the Skyline Trail in the park just north of Cheticamp. The short drive is just an escalating source of pure scenic beauty topped only by the next sight. Well known for its picturesque views, the Skyline Trail is a 7 kilometre looping hiking trail. We arrived at the trail about noon and were surprised, no shocked, to see about 60 or 70 cars there. Looks like the trail will be busy. Everyone is taking full advantage of another perfect Nova Scotia day on possibly the last day of their vacation, Labour Day. The first half of the main trail is a groomed gravel path that winds through open forest to a ridge that runs along the coast. This leads to a boardwalk that yields absolutely stunning views of the Cabot Trail. Hikers often spot moose along the trail and we were fortunate to see three of them in three different locations. Amidst warnings of rutting moose running rampant and charging passers by we watched in awe as they sat then stood, eating, eating, eating, totally oblivious to the growing crowds of people talking (not whispering) and taking photographs. There is also other wildlife present. Tragically, in October 2009 a young Canadian folk singer was attacked and fatally injured by two coyotes while hiking on the trail. The second half of the loop winds over stony ground high above the gulf. This levels off and the vegetation thins to usher you through meadows back to the parking lot. It is this variety of terrain that makes the Skyline Trail so interesting and pleasurable. 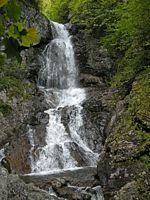 The Uisge Ban (Gaelic for “white water”) Falls Trail is across the Cape on the southern end of the island. The drive from Cheticamp takes you past rugged, panoramic gulf views through the Margaree Valley to Baddeck. The trail, about 15 kilometres north of Baddeck, is accessed by a beautiful drive through the countryside. The trail is divided into two distinct and different paths; the woodland River Trail and the Falls Trail. The River Trail loops along the banks of the North Baddeck River. This is well worth the extra distance from the main trail as it proceeds across wooden footbridges along a ridge overlooking deep gorges, small falls, and places where the water has driven through bedrock creating steep rock banks. There are a couple of scenic bridges crossing the stream. The trail is also quite dry and the terrain is very level except for a mild climb at the end. Alternatively, you can follow the loop back to the fork in the trail and back to the parking lot if you wish. The Falls Trail will guide you to the source of the “Uisge Ban” name. You will begin to hear the roar of the water as you approach. The waterfall at the end of the trail is spectacular, after all, that is your destination and you should expect nothing less. It is somewhat awe inspiring as the white water cascades over the rugged rocks. We are sharing this entire hiking trip on Cape Breton with friends we had not seen in 25 years. It was almost like a religious gathering at the falls. What a wonderful place for us to be together. It certainly took me back to the wonderful times we had experienced with them in the seventies and early eighties. Those were irreplaceable days and now we had a chance to recapture that grandeur of both scenery and companionship. If ever there was a finer place to have our lunch I certainly have not yet found it. Sitting on the rocks listening to the rush of the falls is extremely relaxing and rewarding. We are so fortunate to have this opportunity. Normally Karen and I would be doing something similar to this, probably in some far off land. This is very special to me to be able to experience it with the people that we had lost touch with but so often wondered where they were and what they were doing. We spent a good hour just staring at the falls and reflecting on how beautiful it all is. Our last day found us on top of Old Smokey. 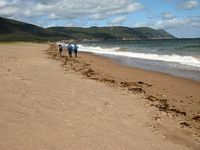 Cape Smokey is a dramatic spit of land jutting out into the Atlantic Ocean from the east side of Cape Breton Island. About eight kilometres past Ingonish Smokey Mountain looms a thousand feet in elevation along the cape’s ocean cliffs. The Atlantic Ocean is breath taking as it lies deep blue beneath a perfect clear blue sky. The Smokey Mountain Hiking Trail is a rugged eleven kilometre trail featuring spectacular views of the Atlantic Ocean and the highlands. It takes three to four hours to traverse and is rated three out of five for difficulty. We started in the parking lot with a vast, sweeping view of Cape Breton’s Atlantic coastline. A staggering sight – what a wonderful way to start the hike. The trail is very narrow and very rough and uneven, strewn with rocks and bordered tightly and heavily by strong, sharp, scratchy shrubbery. After a short passage of relatively flat ground the trail takes a nose dive down a very long, rocky hill. At the bottom is a sign proudly proclaiming one of five kilometres. Sounds easy eh? But remember, you have to come back as well. From that point on it seemed to be a never ending climb, undulating at times, sometimes steep, sometimes gentle, interspersed with man-eating wet bogs, mounds of moose poop the size of large dinner plates and lookouts leading to the most magnificent sea views on earth. The forest trail continued to rise as one ridge conquered became the beginning of a new one. Just when you thought you were at the top the trail dipped and a new climb greeted you. Suddenly we really were at the top and the trail descended rapidly over very rough terrain. Slipping and sliding for about half a kilometre we arrived at a lookout deck that made us all feel, yes, the trail was long and the trail was not easy to walk on, but oh, what a view! About a two hour hike plus a lunch stop had culminated in a little piece of heaven. The hike back, after the initial rigorous climb, was a series of varying grades of downhill. It took only an hour and a half but as Mike said, “We were on a mission.” I don’t know exactly how they rate these trails but this was a three and I found it difficult enough. A four would probably be torturous and a five would surely kill me. As Mike and I discussed our whereabouts I was sure we had a long, hard kilometre climb ahead of us but Mike surmised that the tree line was thinning and we seemed to be looking at tree tops so we were in fact nearly back at the van. As we rounded the next curve we saw the Smokey Trail gate and I, for one, could not have been happier to admit that I was wrong. 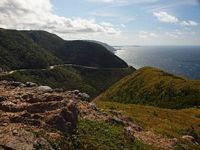 Our visit to Cape Breton Island ended after another ten kilometer plus day with the realization that we actually had hiked an average of ten kilometres per day over seven days – and not on flat open roads by any means – some treks had been very rough indeed. It was nice if not a little amazing that all the hikes we had undertaken were all very different terrain, scenery, vegetation, even the water views were varied. No two were alike and it was this tremendous variety that made this fabulous time we’ve spent here even better – but that is what Cape Breton Island is all about. More by Eric Whitehead in his book ‘Then there Was One‘.